A US-backed alliance of Kurdish and Arab rebels has advanced into territory held by so-called Islamic State (IS) in Deir al-Zour province, eastern Syria. Kurdish military sources said the Syrian Democratic Forces (SDF) had captured some 15 villages from IS. Unidentified air strikes killed 11 people in one IS-held village, though it was unclear if this was linked. The SDF hopes to cut IS's supply lines from the oil-rich province to the group's stronghold Raqqa, in the north. Syrian government forces in Deir al-Zour have also been battling to push out IS, which commands most of the province as well as its capital of the same name. The latest development comes just days before UN-sponsored talks between the Syrian government and opposition in Geneva, Switzerland - the first such meeting in nearly a year. Who is fighting Syria's battle of al-Bab? The UN envoy to Syria, Staffan de Mistura, has played down hopes for the talks taking place on Thursday, which he says are aimed at exploring the possibility of a political process. A nationwide ceasefire - which excludes IS - took effect in December after peace talks in Kazakhstan. The deal was brokered by Russia and Iran, both allies of the Syrian government, as well as Turkey, which is supporting some of the rebels. 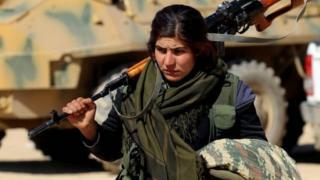 Kurdish military sources said on Tuesday it was the first time the SDF alliance, which includes the Kurdish YPG militia and Arab fighting groups, had crossed into Deir al-Zour province. The UK-based Syrian Observatory for Human Rights described the operation as the SDF's biggest incursion yet into Deir al-Zour province. It said air strikes on a petrol station and garage in one of the province's villages killed 11 people and wounded 35. The province has been targeted in the past by US-led coalition planes, as well as by Russia, an ally of the Syrian government. US-led air strikes have helped the SDF forces to seize large swathes of territory in northern Syria from IS. IS militants advanced into Deir al-Zour province in 2014 and went on to impose a siege on the city of Deir al-Zour, seeking to oust government forces from an airbase and neighbouring districts along the River Euphrates. Separately, Turkish-backed forces are fighting in close proximity to Syrian government forces to regain control of the northern town of al-Bab from IS. The UN said on Tuesday an estimated 5,000 civilians were trapped by fighting in and around the town. More than 300,000 people have been killed and 11m others displaced since the uprising against President Assad began in March 2011.